Learn how to create amazing shadow effects in CSS using the Box Shadow Property. This tutorial will teach you how to create inner and outer shadows and will give you sample code for different kind of shadows you can create using CSS. You will also learn how to make a text box with a shadow effect. Please Note: Only if your browser supports box-shadow then you'll see the shadows below. This div has an outer shadow. This div has an inner shadow. These effects can be made using the Css Box Shadow Property. There are two types of shadow effect that are possible using Css Box Shadow Property. Look at the images above. The first one has Css Shadow Property applied on the outer side of the div element. The Second one has Css Shadow Property applied to it on the inside of div element. This Property works for IE9, Opera, Firefox and Webkit browsers like Safari, Chrome. IE9 and Opera use simillar code to display the shadow while for Firefox and Webkit Browsers, a prefix needs to be added before the code. The only difference between the two codes is the keyword inset. If you put it in the code you'll get an Inner Shadow. The rest of the code is same. Color : To create an inner shadow. : Shifts the shadow horzontally along the X-axis. : Shifts the shadow vertically along the Y-axis. 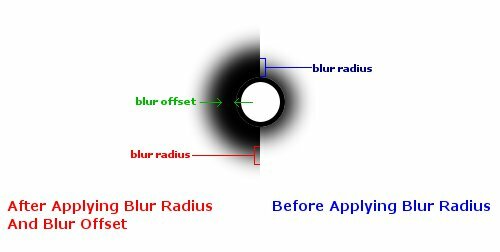 : Blur Radius for Radial Bluring effect on the shadow. :(optional) Offsets the Blur Radially. : Here Color name or Hex Color Code or RGBA color values can be declared. Lets start by declaring width and height for the <div id= example > and then the Shadow Property. To apply shadow effect to this <div> </div> element we'll have to give it an id. Give it an id= example . To display Shadow in Firefox a prefix -moz- needs to be added before the code. And for Webkit Browsers -webkit- needs to be added before the code. You should put all the three code types so that the shadow is visible on all browsers. Now you only have to paste this empty <div> </div> inside your <body></body> tags. Here are some examples how you can manipulate the Outer shadow just by changing the Offset and Blur radius values. Only blur radius is added here. Only Blur Radius and Blur Offset are added here. and Blur Offset are added. This is made using CSS Box-Shadow Property. This is made using CSS Box-Shadow Property. This is made using CSS Box-Shadow Property. This is made using CSS Box-Shadow Property. This is made using CSS Box-Shadow Property. This is made using CSS Box-Shadow Property. This is made using CSS Box-Shadow Property. This is made using CSS Box-Shadow Property. This is made using CSS Box-Shadow Property. This is made using CSS Box-Shadow Property. This is made using CSS Box-Shadow Property. This is made using CSS Box-Shadow Property. This is made using CSS Box-Shadow Property. This is made using CSS Box-Shadow Property. This is made using CSS Box-Shadow Property. This is made using CSS Box-Shadow Property. This is made using CSS Box-Shadow Property. This is made using CSS Box-Shadow Property. This is made using CSS Box-Shadow Property. This is made using CSS Box-Shadow Property. This is made using CSS Box-Shadow Property. This is made using CSS Box-Shadow Property. This is made using CSS Box-Shadow Property. This is made using CSS Box-Shadow Property. This is made using CSS Box-Shadow Property. This is made using CSS Box-Shadow Property. This is made using CSS Box-Shadow Property. This is made using CSS Box-Shadow Property. This is made using CSS Box-Shadow Property. This is made using CSS Box-Shadow Property. This is made using CSS Box-Shadow Property. This is made using CSS Box-Shadow Property. This is made using CSS Box-Shadow Property. This is made using CSS Box-Shadow Property. This is made using CSS Box-Shadow Property. This is made using CSS Box-Shadow Property. This is made using CSS Box-Shadow Property. This is made using CSS Box-Shadow Property. This is made using CSS Box-Shadow Property. This is made using CSS Box-Shadow Property. This is made using CSS Box-Shadow Property. This is made using CSS Box-Shadow Property. This is made using CSS Box-Shadow Property. This is made using CSS Box-Shadow Property. This is made using CSS Box-Shadow Property. This is made using CSS Box-Shadow Property. This is made using CSS Box-Shadow Property. This is made using CSS Box-Shadow Property. This is made using CSS Box-Shadow Property. This is made using CSS Box-Shadow Property. This is made using CSS Box-Shadow Property. This is made using CSS Box-Shadow Property. This is made using CSS Box-Shadow Property. This is made using CSS Box-Shadow Property. This is made using CSS Box-Shadow Property. This is made using CSS Box-Shadow Property. This is made using CSS Box-Shadow Property. This is made using CSS Box-Shadow Property. This is made using CSS Box-Shadow Property. This is made using CSS Box-Shadow Property. This is made using CSS Box-Shadow Property. This is made using CSS Box-Shadow Property. This is made using CSS Box-Shadow Property. This is made using CSS Box-Shadow Property. This is made using CSS Box-Shadow Property. This is made using CSS Box-Shadow Property. This is made using CSS Box-Shadow Property. This is made using CSS Box-Shadow Property. This is made using CSS Box-Shadow Property. This is made using CSS Box-Shadow Property. This is made using CSS Box-Shadow Property. This is made using CSS Box-Shadow Property. This is made using CSS Box-Shadow Property. This is made using CSS Box-Shadow Property. This is made using CSS Box-Shadow Property. We'll have to use the inner shadow here, with Blur Radius of about 80 px and Blur Offset set at 40px. Then we'll put some text inside the <div id= textbox > . This textbox has a fixed width and height. I've added another Css property overflow which keeps the text inside the <div id= textbox > . → This is the Id of to the div that we are going to use as textarea. → Tospecify Width and height for this <div id= textbox > tag. → This color property changes the font color for the text inside <div id= textbox > tag. → This is the Css Property that makes this <div id= textbox > behave like a textarea. → Box-shadow property for all the browsers. Code for the <body> </body> tag. Now you need add about 150 words or about 1000 characters inside <div id= textbox > to make this textbox scrollable. This is made using CSS Box-Shadow Property.